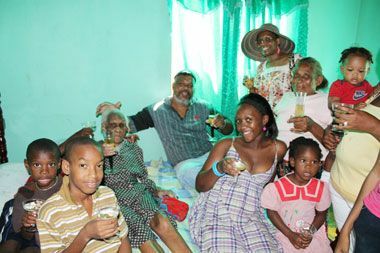 The Keartons resident was surrounded by children, grand and great grand children, along with well wishers, who turned up at her home to congratulate and celebrate with the lively lady, affectionately known as âNenâ, last Saturday, January 7. The mother of six, two of whom are deceased, said that she was feeling very well, despite being unable to move around on her own. She told SEARCHLIGHT that she is happy to reach the milestone which would not have been possible without God. Nen, looking back over the years as far as her memory would take her, recalls travelling form her native High Road, Barrouallie community, to Kingstown by ferry, which was the regular mode of transportation at that time. Although she does not remember the name of the school she attended, she remembers one of her educators, âTeacher Sandyâ, who was a influential school master of the day. A farmer in her time, Adams remembers picking cotton on the Wallilabou estates and also indicated that she planted mainly root crops, especially cassava, dasheen, arrowroot, yam and potato, which she claimed she loved to eat in her day. âI was ah eater; I could still hold on to food,â Adams, who can no longer enjoy her favorite foods, joked. âI loved to make cassava bread and duccana. I loved to eat tannia, potato and dumpling in boileen. I only eat rice now, but I still eat well. Adams expressed thanks to her children, who take care of her on a daily basis, and of whom she is very proud. Her children, who were present when SEARCHILGHT visited, also expressed mutual adoration and gratitude to their mother, who they said was a disciplinarian. âShe used to make sure we go to school and always rebuked us. When we did anything wrong she would lick us me and say âmanners and behavior carry you through the world; have respect for peopleâ,â recalled Tyrone Hope Adams, Nenâs son and caretaker. âShe used to go all out and provide for her children, and up to this present time, I never get in police custody; she was strict, strict, but it paid off,â he added. Teckla Paul, another of Adamsâ children, recounted that her mother was an avid dancer and sports enthusiast, who when it was possible, participated in many social activities organized by her church. Tecklaâs daughter Daphne Oliver also spoke her grandmother who was always praying and humming hymns. Another granddaughter, Velma Simmons, who visited her grandmother from the United Kingdom to celebrate the occcasion, said that although she did not grow up with Nen, she always enjoyed being around her when she visited regularly. On Sunday, January 8, members of the St. Patrickâs Anglican Church Mothersâ Union paid a special visit to Adams, during which the jovial old lady had a grand time with those who came out to celebrate with her. Shortly before SEARCHLIGHT visited her at her home, located on the street which bears her name, a special service was held for her by Father Brooker, priest at the St. Patrickâs Anglican church. An upbeat Adams, who spent all of her life serving in the church, said that she will continue to be grateful to God and love people until her time is up. âThat is all I can do until God say âno more,ââ she added.